Some years ago Alan Bennett reviewed a collection of essays, Larkin at Sixty for The London Review of Books. He didn’t think Larkin would have liked it much, and wondered what present the poet would have appreciated more. He mentioned this painting by Edward Hopper. I wonder if Bennett had this poem in mind. 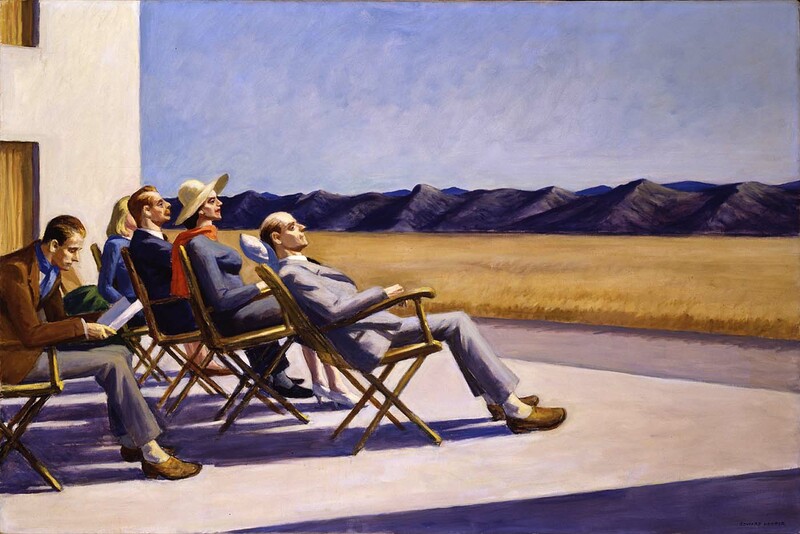 Hopper’s subjects, taking the sun in their stiff suits, gaze at an undulating moutain range instead of the sea. But they also experience “half a pleasure half a rite”. Is it a ridiculous conceit to imagine Larkin as the poet on the left reading his book?